Plastic Christmas tree shopping at Jusco, the immaculate Japanese (the Swiss of Asia!) 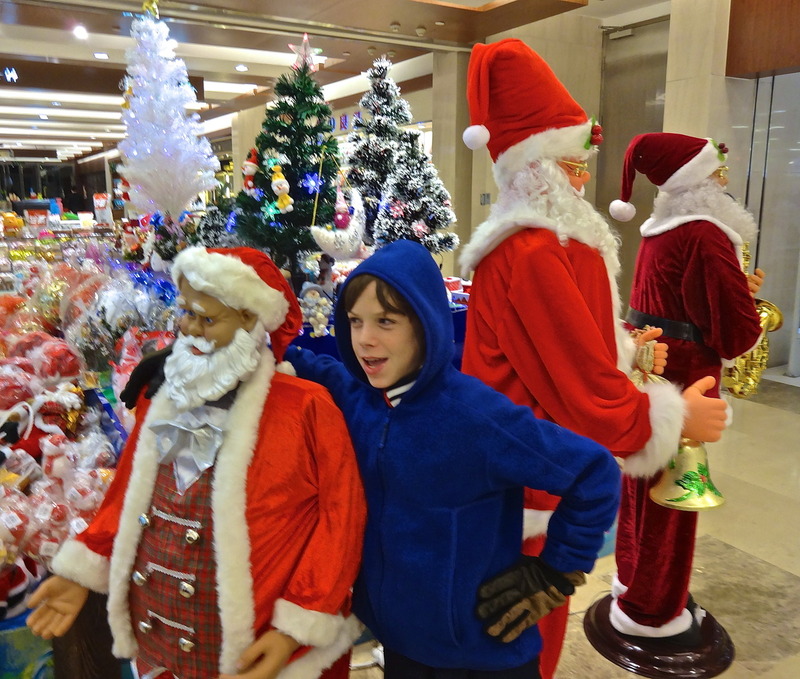 supermarket in Qingdao, a dearth of candy canes or figgy pudding, but finding Christmas stockings in the local hutong were all part of our first Christmas in Asia. China at least celebrates the secular and financial side of the season. One restaurant we regularly visited kept Christmas decorations up year round, perhaps in attempt to attract Western patrons. The local population apparently didn’t mind giant Santa Claus faces plastered on the walls in July. At left, Alex picked out the middle all-green miniature tree with the LED star on top over the garish frosted models, as he leans on a curiously tan and Asian-looking Santa. Like most Asians, St. Nick here is relatively less obese and pre-diabetic than the American version. China has a surprisingly ample supply of Christmas decorations, albeit no mention of the religious side of the Christmas story, and sticks to the more commercial aspects of gift giving, decorations, Santa Claus and colored lights. The Chinese New Year in late January is the real time for celebrations, gift giving, and family get-togethers. Religion in China-any religion is officially unofficial but is uniquely tolerated when practiced by the many expats living and working in China, provided it is done discretely and does not involve any attempt to convert anyone. Most Sunday morning Christian church services are held at large hotel conference rooms, followed often by traditional Western style brunch at the hotel restaurants. “Churches” are required to check for foreign passports at the door and are responsible for refusing locals from participating in church services or activities. Iconic images such as crucifixes, manger scenes at Christmas, statues of Mary or Jesus are discouraged. Large hotels and shopping malls put on amazing Christmas tree displays with all the lights and trappings of any European or American counterpart. Even if you can’t find Christmas carolers in your neighborhood, the local Starbucks still provides an eggnog latte and frosted snowman cookies to lessen the seasonal homesickness from this time of year.